The most obvious advantage is the dollar savings! With a few hundred dollars you can equip your home with great home workout equipment, and when you consider the gym subscription prices nowadays that go from around $200 per year for the cheapest and up to $1000 for some of the more expensive, exercising at home can be very economical in the long run. By training at home, you save a lot of travel time and avoid traffic jams if you don't live close to a gym. It also provides you with a lot of flexibility: You don't need to comply with strict gym hours and can train anytime you want. Training at home also eliminates any waiting time for gym equipment to become free. In some gyms, at peak times, it may take several minutes before you can use a particular machine or bench. This makes you waste a lot of time, or forces you to change your training program. If you are taking any protein or other type of supplements, it would be easier to manage them at home, far from the suspicious gaze of gym members. Finally, if you're shy, do not like changing rooms, or are afraid to be in a place filled with people in much better shape than you, by exercising at home, you would avoid all these little annoyances. When you train at home, you may lack the strong motivation you get at the gym where you see others training as well. One way to get around this problem is to share your training with a friend or member of the family. There are dozens of working out equipments and home mini-gyms out there. The Bowflex PR 1000 Home Gym and the Weider Ultimate Body Works are the most popular home-gyms bought by Amazon customers. They also enjoyed excellent reviews. Such popularity does not come without some real value offered by the products. This article will describe and compare the Bowflex PR 1000 Home Gym and the Weider Ultimate Body Works workout equipments to help you decide which would be best for your own workout needs. The Bowflex PR1000 is a compact home-gym, 81 inches high, 38 inches wide and 84 inches long. So, it does not take up much space. It requires an area of about 8.3 feet by 6.5 feet for effective training. The most important characteristic of this home-gym is that it does not use any free weights. It is equipped with a number of power rods that simulate weights through the resistance that they generate. Accidents caused by dropping weights, and joint pain observed often in people using free weights are thus eliminated. ​By increasing gradually the number of power rods attached to the cable pulley system, one can generate various levels of resistance simulating weights from 5lbs to 210 lbs. The power rods are made of a high-tech composite material manufactured under high quality control measures, sheathed and tested a number of times to ensure excellent quality and durability. It is designed for a maximum user body weight of 300 pounds. Note that the Bowflex PR1000 equipment can not be upgraded to generate more than 210 lbs of power rod resistance that maybe required by some advanced body builders. For most people who are after a good workout and a reasonable amount of muscle, 210 lbs are more than enough. But if generation of up to 310 lbs of power rod resistance is required, one should consider the Bowflex PR3000 which is upgradable to 310 lbs, but is also more expensive. The Bowflex PR1000 allows more than 25 exercises that work out and develop every major muscle in the body. There are exercises for the chest (including bench press), the back (including various pull-downs and back extensions), the shoulders (including shoulder press), the arms (including those for the biceps and triceps), the legs (including those for the hips and calves), and the abdomen. There is a built-in rowing machine (equipped with a sliding seat rail) excellent for good cardio. Rowing can also be used for warm-up and cool-down before you start your regular exercises. The vertical bench press with incline and flat adjustment converts to a rolling seat for aerobic rowing. There is over 200 lb. power rod resistance and also 4-inch upholstered roller cushions for leg curls and leg extensions, and triple function hand grips for lat pull down. The multi-use hand-grips and ankle cuffs have been designed to enhance performance and flexibility during workout sessions. Multiple cable pulley position allows you to easily change the angle of resistance and increase effectiveness of many exercises. Finally there is a new integrated media rack to hold your smart device. The equipment folds for storage and comes with a manufacturer's warranty of 1-year for the frame and 5-years for the rods. The Weider Ultimate Body Works is a very compact mini home-gym that measures 71 by 26.5 by 49.5 inches. Like the Bowflex PR1000, the Weider does not use free weights. It uses body weight in conjunction with with four adjustable power bands to provide thorough workout, regardless of the users' fitness level. ​The built-in mechanism turns the body weight into natural resistance that can be used to execute a large number of exercises. The four resistance power bands serve to increase the weight resistance beyond the body weight, providing up to 50 pounds of additional resistance. One can also modify the intensity of the exercises by selecting one of the seven possible incline settings. An unrestricted cable and pulley system provides the user with the possibility to execute a wide variety of exercises that increase flexibility and strengthen the muscles. The Weider Ultimate Body Works offers over 100 exercises to work out, define and shape the arms, shoulders, thighs, back, abs, hip and calves, while allowing to increase overall strength and flexibility. The included Workout Guide explains clearly which exercises work on what muscle groups and how to correctly execute each exercise. It also provides additional exercise suggestions for the more advanced user. The mini-gym slides away easily for storage and comes with a 30-day satisfaction guarantee as well as a 90-day limited warranty. So which home workout system to buy? Bowflex PR1000 can achieve a maximum resistance of 210 pounds using the power rods. On the other hand, Weider Ultimate Body Works uses the body weight to generate the resistance, and this can be increased another 50 pounds using the adjustable power bands. So, with Weider Ultimate Body Works, if you are about 180 pounds, you could achieve a weight resistance of 230 pounds, which is more than what Bowflex PR1000 can generate. But if your weight is just 140 pounds, then the maximum resistance you would have on Weider Ultimate Body Works would be 190 pounds, which is less than what Bowflex PR1000 can generate. Another difference between the two products is the built-in rowing machine with the sliding seat that comes with Bowflex home-gym which can provide excellent cardio workout and warmup/cool-down exercises. This is not provided on Weider Ultimate Body Works, even though one can make up exercises to simulate rowing (after all over 100 exercises are suggested by the Weider guide). Finally, one needs to consider price and warranty. Even though Bowflex home-gym is quite a bit more expensive than Weider Ultimate Body Works, it comes with a warranty of 1-year for the frame and 5-years for the rods which says something about the high quality and durability of the product. Weider offers only a 90-day limited warranty. You will find below the Bowflex PR1000 described above, as well as other Bowflex equipment. Please click your selected product to check the price or to purchase. When you click any of the products below, the description page will also provide you a comparison between the various Bowflex workout equipments. We believe that the PR1000 represents the optimal value for the average buyer in terms of price and the training possibilities it offers. 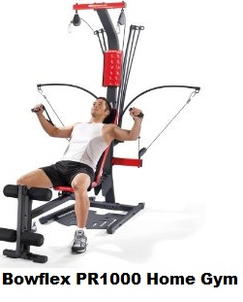 You will find below the Weider Ultimate Body Works reviewed above, as well as other Weider equipment. Please click your selected product to check the exact price or to purchase.